It may be helpful to understand both, but it is interesting to know which we focus on first. The parts we see first are often those we put our energy into encouraging or fixing. We concentrate on their potential or problems. Let’s explore how this can work in action. I came across this approach when working at the Slough Project in 1967. This was a pioneering venture for helping disadvantaged young people. The staff focused on the responsible and creative parts of each person. The youngsters rose to meet the expectations and the project was successful. I moved on to running therapeutic communities for troubled teenagers. 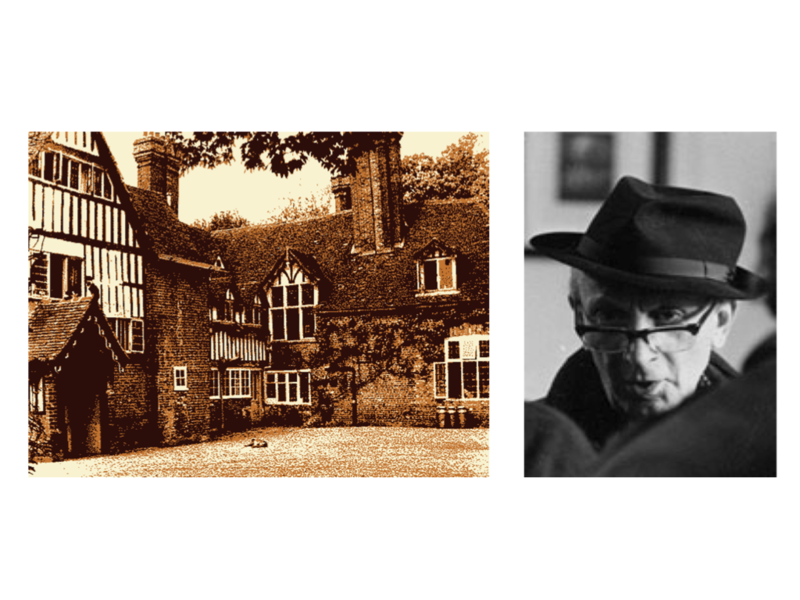 As part of my development, I visited George Lyward, who ran a remarkable community at Finchden Manor. He talked about looking for the golden moments when a person comes alive. This philosophy was endorsed by many of the writers I read. These included people such as Abraham Maslow, Carl Rogers, Viktor Frankl, Virginia Axline and Virginia Satir. Everybody has their own set of questions they ask when looking at a person. 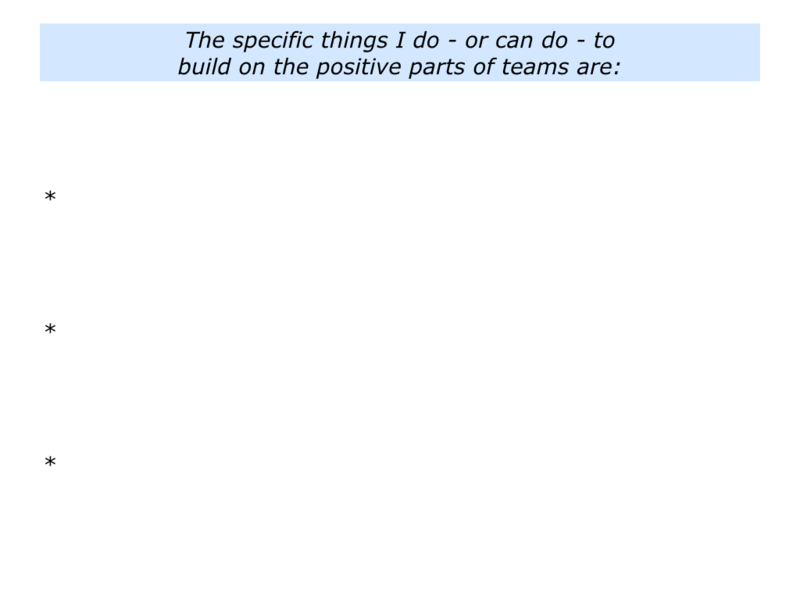 The positive approach uses some of the following questions. When does the person come alive? What are the things that give them positive energy? When are they in their element – at ease and yet able to excel? What are their strengths? What are the specific activities in which they deliver As, rather than Bs or Cs? How can they build on their As and manage the consequences of their Bs and Cs? When do they see the destination quickly? When do they go ‘A, B ___ then leap to ___ Z’? Where do they quickly see patterns? Where do they have good personal radar? Where do they have the equivalent of a photographic memory? Where do they score highly on drive, detail and delivery? When do they flow, focus and finish? Where do they have a track record of finishing? When has the person overcome difficulties? What did they do then to overcome such challenges successfully? How can they follow similar principles – plus maybe add other skills – to overcome challenges in the future? What is their successful style of working? What for them have been their most deeply satisfying projects? What was satisfying about each of these projects? What were the principles they were following? How can they follow these principles in the future? You will have your own approach when looking at people. If you wish, try tackling the exercise on this theme. This invites you to do the following things. Describe the specific things you do – or can do – to focus on the positive parts of people. Describe the specific things you do – or can do – to build on these positive parts. “Taking over a new team is fascinating,” said one soccer manager. “My normal approach is to build on the positive people in the team. Sometimes I also bring in leaders who will provide the backbone of the team. “My approach is to build on the players’ strengths. I often find these strengths during training sessions by moving players around and putting them in different combinations. “Sometimes you get a surprise, such as two players working together as if they can read each other’s thoughts. The purpose – the team’s reason for being – and the picture of success. The principles that people can follow – including the required professional standards – to achieve the purpose. 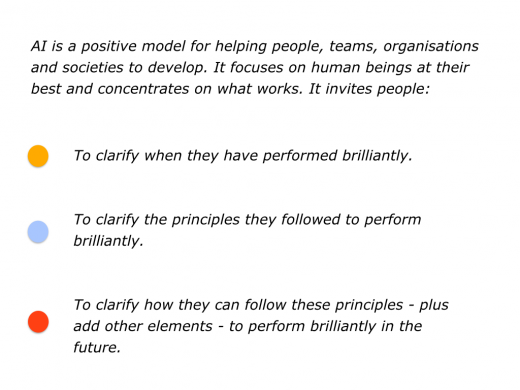 The positive benefits – for all stakeholders – of achieving the purpose. People are given time to reflect. They need to decide whether they want to contribute to achieving the purpose – be it climbing a mountain, embarking on an adventure or whatever. People who choose to opt in make clear contracts about their contributions towards achieving the goals. Good coaches build a positive culture in which people can do fine work. When watching people in action, for example, they focus on the following things. Good coaches then encourage, educate and enable people to achieve ongoing success. You will have your own approach when looking at teams. If you wish, try tackling the exercise on this theme. This invites you to do the following things. 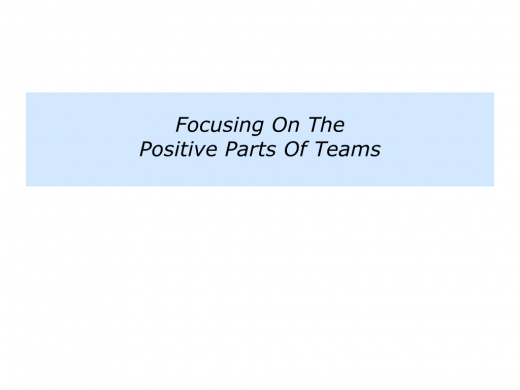 Describe the specific things you do – or can do – to focus on the positive parts of teams. Imagine you have been asked to shift the culture in an ailing organisation. You will aim to do three things. To communicate a positive vision and show the benefits of achieving the picture of success. To build successful prototypes that demonstrate the desired future culture. To invite people to decide whether they want to join the future culture and – if so – make their best contribution towards achieving the picture of success. You can read more about how to create such a positive culture via the following links. Different leaders take different routes regarding how they work with the existing people in an ailing organisation. There are three possible routes to follow. You can clarify what such people are doing right to perform superb work and expand these principles across the organisation. You can clarify what people were doing right then to do great work or overcome challenges. You can then enable people to follow these principles again in the future. You can try to clarify their personal issues or perceived obstacles and then spend time trying to fix the situation. Some leaders employ a mixture of all three approaches. But many are now moving towards the first two options. Appreciative Inquiry, for example, is a positive way of working with organisations. 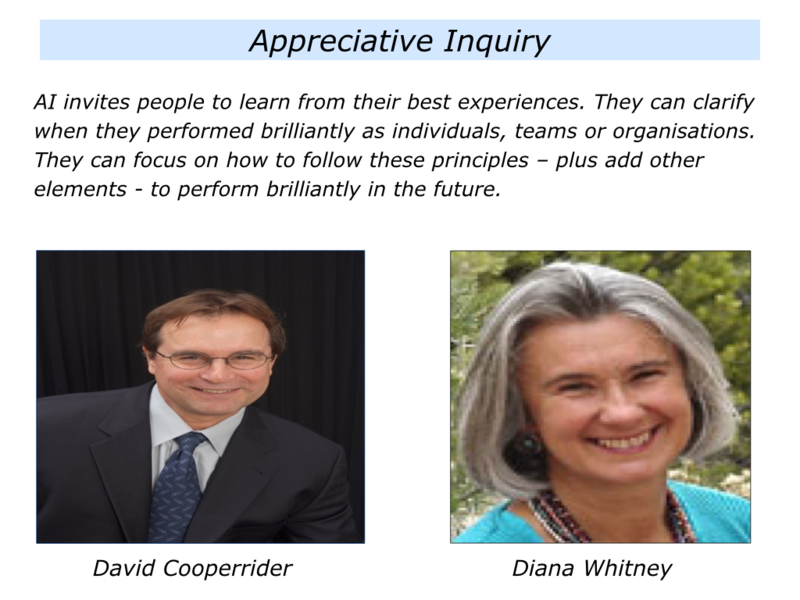 Devised by David Cooperrider and Diana Whitney, it enables people to identify and build on what works well in an organisation. How to give great customer service? How to improve internal morale? How to make better use of the talents we already have within the organisation? 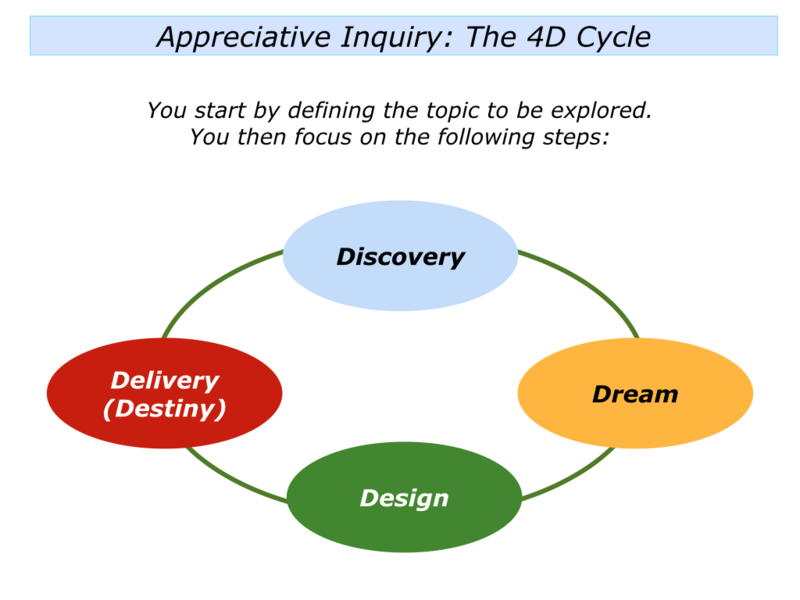 People then go through a 4D process for delivering success. People describe when the organisation has performed brilliantly in the particular area they want to tackle. They clarify the principles it followed to perform brilliantly. People translate these principles into a specific goal they want to achieve in the future. It is vital that the goal is an expression of the principles they believe in and they know work. The goal must also be stimulating and stretching. People focus on the key strategies they can follow to give themselves the greatest chances of success. They then commit to achieving the goals. People implement the principles successfully. They do great work, find solutions to challenges and do whatever is required to achieve the specific goal. Appreciative Inquiry can be used to tackle extremely difficult problems. One leading company, for example, used AI to tackle an issue it had with sexual discrimination. When have women and men worked together brilliantly in this company? What were the specific projects they tackled? What did they do right to work together well? What were the results? How can people follow these principles in the future? The company received hundreds of positive examples. 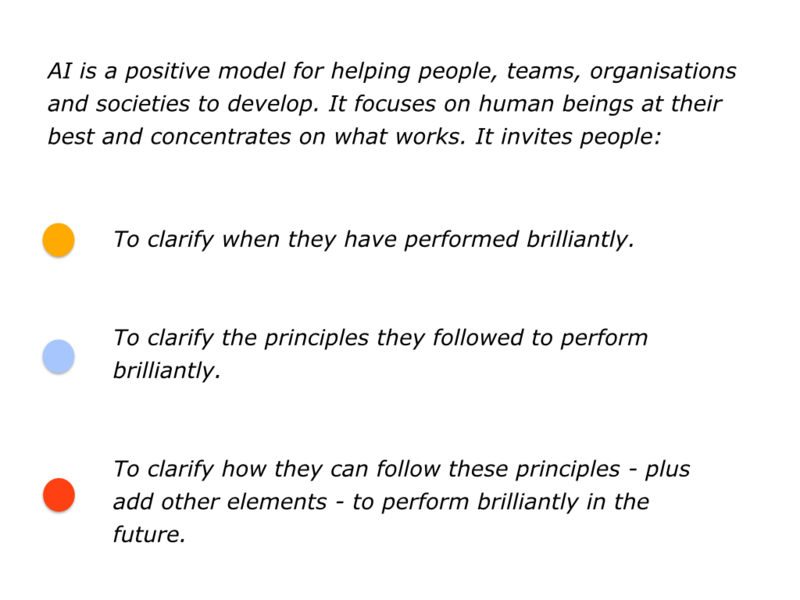 People identified the successful principles and put these into practice. Since then the company’s internal morale scores have risen considerably. “What we focus on, we become,” we are told. If we focus on strengths, we become stronger and optimistic. If we focus on shortcomings, we become disillusioned and impotent. 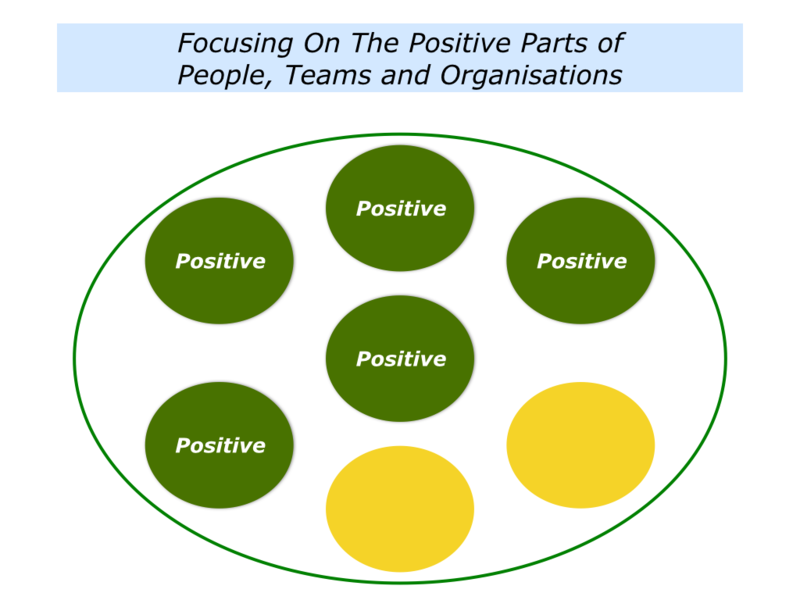 One approach is to build on the positive parts of a person, team or organisation. This can provide the springboard for achieving future success. 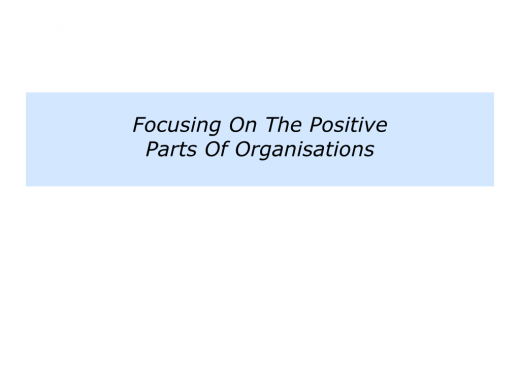 Describe the specific things you do – or can do – to focus on the positive parts of organisations.